A few weeks ago I was sitting around the bar with a few friends when someone mentioned that they had just done the 7-Minute Workout, made famous in a recent New York Times Magazine article. If you aren’t familiar (and none of us were), the 7-Minute Workout is basically this: A high-intensity interval circuit, featuring 12 distinct exercises performed for 30 seconds each, with 10 seconds of transition in between each exercise. The whole thing only takes 7 minutes. When he finished explaining the workout, we all looked at each other, looked back at him, then immediately began making fun of him. Poor guy. “There is simply no way one can get a good workout in 7 minutes,” I remember blurting out along with laughter. But the next day my curiosity struck, and I decided to look up this magical workout. A few minutes later I gave it a shot. As you can see, it hits all the major muscle groups. You might also notice that they designed the order so that one group is resting while you work another. No back-to-back upper body exercises, for example. When I laid down on the floor after trying the workout for the first time, I was hit with confusion. How is it that such short workout has me feeling so wiped out? “There’s very good evidence” that high-intensity interval training provides “many of the fitness benefits of prolonged endurance training but in much less time,” says Chris Jordan. That explains why I was so tired so quickly, but this is in stark contrast to traditional thinking. I was always taught that for well-rounded fitness, I need at least 150 minutes of aerobic training per week plus additional strength training. So if a short high-intensity workout is equivalent to several hours of running, can we really cut all that down to just a 7 minute workout a few times a week? To find out I asked my friend and running coach Jason Fitzgerald of Strength Running. When I asked him if I could get the same benefits from a high-intensity interval training (HIIT) workout as I could from a long run, he wasn’t happy with me. Well, this is just wrong. The studies say that HIIT increases VO2 max in a similar way that endurance training does. BUT VO2 max is not the same as performance. You can increase your VO2 and not become any faster. Many HIIT (like CrossFit) people claim that you can gain endurance through HIIT. It’s more complex than that and you don’t get faster by doing HIIT. If you want to know more about his opinions on this and HIIT workout programs like Crossfit Endurance, a recent post of his is a must read. Whoa. Jason seems pretty clear, the 7-Minute Workout alone isn’t going to give you that marathon PR. But as he pointed out to me later in his response, these are basically strength exercise and that’s exactly what he recommends to all runners. As Jason’s response suggests, a 7 minute interval workout alone, no matter how intense, isn’t going to provide the type of conditioning most runners are looking for. But that doesn’t mean we should throw this one to the birds like its the next Prancersise. If properly paired with a short run at medium intensity, the 7-Minute Workout could have a very positive effect on your running fitness. That’s why I’ve been adding what I call the 30-Minute Workout to my regular weekly routine. If you are anything like me, you have a few days each week which don’t allow for a good solid run. I usually end up going out for a 30 minute throw-away run with little benefit other than the miles logged on Stava. And that isn’t going to get me a marathon PR either. 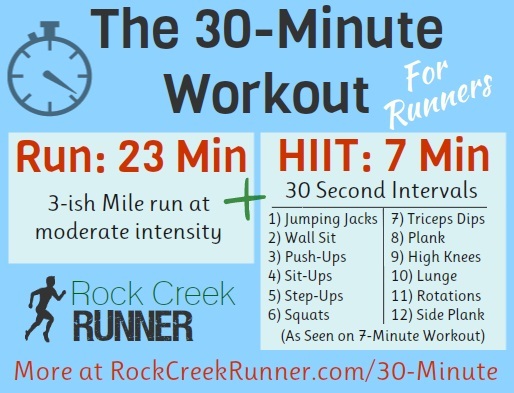 This 30-minute workout is a great way to get the benefit of a short run, but also quickly target key areas of the body to build strength and ultimately improve your running. You’ll have the benefits of increased heart rate, breath, fat-burn, leg strength, and endurance from the run, and upper body, core, and targeted lower body strength from the interval workout. This type of workout shouldn’t replace key training runs like intervals, hills, and long runs, but it can act as a great alternative when time is short. Just make sure you aren’t doing high-intensity training on a daily basis. Keep it to a few times per week. 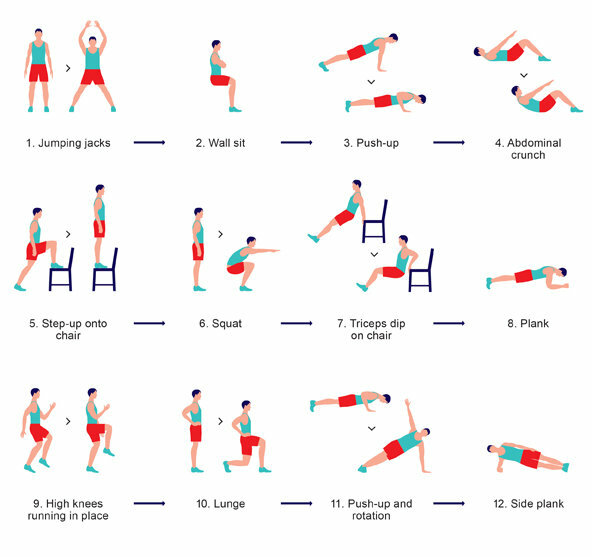 It appears that a 7 minute workout is just too good to be true, but what we can gain from workouts like this is a well planned strength training routine. And that is something I’m willing to spend 7 minutes doing. I think you’re overlooking the fact that the seven minute workout was designed to be a quick and easy way to get some exercise into the day of a person who is otherwise sedentary. I don’t believe it was designed for people who spend hours running/biking/lifting etc, it’s been created to get people up and moving. And it’s doing that. People who are already fit and exercise regularly aren’t going to replace their current routines and exercises with this. However it may well lead to some non-active people improving their health and moving onto more exercise. Hey Melinda, thanks for reading and for taking the time to comment! I’m sorry if it came across that way, but I wasn’t trying to say that the workout is useless. You are right that it is a heck of a lot better than doing nothing. Like I said in the post, the first time I tried it I was really surprised by how well it worked me over. The point of my article is to discuss if a program like this is useful to runners. When NYT is claiming “even a few minutes of training at an intensity approaching your maximum capacity produces molecular changes within muscles comparable to those of several hours of running or bike riding,” I think it is worth discussing. I know that if I could avoid spending all my Saturday mornings on the trail and still have the same results, I probably would. Unfortunately, I don’t believe I can. But I will continue to add programs like the 7-Minute Workout to the end of shorter runs, because I do believe they have big benefits.